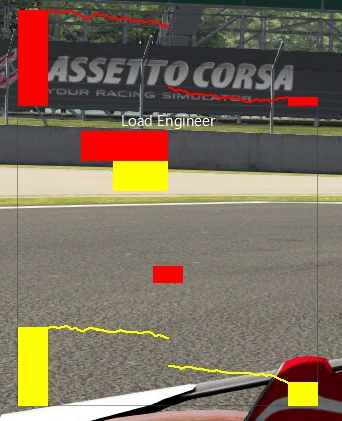 Based on the weight transfer stuff I added to Tyre Pressure Engineer, I created a new app - Load Engineer, which is more graphical. I can make it scalable (probably). That would make it pretty small though, wouldn't it? Thanks Wally, it will be interesting to see what results I get as I do all my setups from feel only . I added some numbers: top number is the front roll couple percentage (front weight transfer divided by total lateral weight transfer). 50% is balanced. Higher than 50% means the front is taking more of the weight transfer, and may tend to understeer. Lower than 50% means the rear is taking more of the weight transfer, and may tend to oversteer. The middle number is the % front weight distribution. Again, 50% is balanced, more than 50% means more weight is towards the front, less than 50% means more weight is towards the rear. I have been trying to get into this forum, but keep getting no permissions/verboten. I have link my steam account but that has not helped. Any secret/bribe/sacrifice that I need to know? I'll upload it to this thread. It was already attached to the 1st post!